BookBrowse interviews The FRESH Ladies Book Club about all aspects of their book club. Could you please tell us a bit about The FRESH Ladies? Sue: We are a group of ten ladies, ranging in age from fifties to ninety-five. Our eldest member, Rita, is one of our most energetic. She has shared many wonderful stories and life experiences with us, particularly stories about her years as a teacher. Five members have been in the club since the beginning: Rita, Mary Ann, Maria, Karen and myself. Our youngest member, Jill, recently moved with her family to California. We hope that she will rejoin us when they return to the area because we miss her and her perspective as a thirty-something mother of two. Kathy M: We are all ladies with very different personalities: gentle and supporting, assertive, good listeners, those that can get "off topic" if not reined in, some who have much to offer to the discussion but need to be drawn out. Barbara: Another form of diversity is the career paths we have followed: computer science, commercial art, school principal, teacher, librarian, and occupational therapy. This gives different insights into our reading. 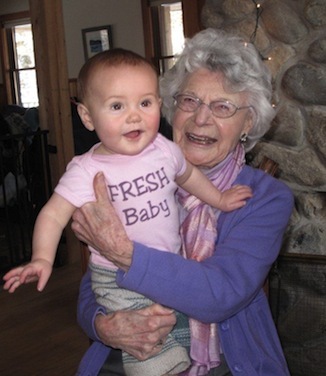 Kathy M: We are so fortunate to have Rita, who readily shares her many years of living and experience and adds definite "history" to many of our discussions. For example, last year we happened to read many books set during WWII. Our eldest member could share what it was really like for her family and neighbors during this time. As a teacher, I am always interested and gratified to see how much she and I have in common though we taught school decades apart. Karen: I will always remember Rita bringing her food ration book from the War and her talking about finding her mother taking apart the toaster one day and learning that her mother had taken a job in a small appliance factory during the war (unbeknownst to her husband). What are book club meetings like for you, Rita? Rita: As the ninety-five year old, I try to attend every meeting because through the mind of the young members, I see the future. They are well educated, intelligent and have learned to "think." How did you all come up with the name The FRESH Ladies? Kathy L: I think it is interesting where the name came from. The members submitted a title and voted for their favorite. Our oldest and most cherished member, Rita, submitted the winning title which comes from the three towns the members come from. FRanconia, Easton, and Sugar Hill. Hence, the FRESH Ladies. Is there something in particular that makes your group special to you or that you think might be different from other groups? Sue: We have become very comfortable with each other, and this comfort helps us to openly discuss. We also care about each other. When Rita was bedridden for three months, we brought meals, made visits, and generally did whatever we could to help out. One of our very creative members, Kathy, brought a craft project, which they enjoyed together while Rita was in bed. Oh my gosh, that's a lovely story. You all seem very close. Barbara: We enjoy a level of conversation that is not easy to establish. Is there anything else that makes The FRESH Ladies unique? Mary Ann: Without a doubt the age difference is what makes our group unique. Discussing a book that took place during WWII, our oldest member brought a rationing book to the meeting. Our youngest member (a new mother) hadn’t even been born yet. Karen: Our book club also has a sense of playfulness that I think is unique. When we read Nefertiti people actually dressed up in costume from that period in Egypt. What fun! No stuffy bookworms in this group. Sue: I founded the club in January, 2005. I had always wanted to be a book club member. We had lived here for just a couple of years, and I was hoping to build on the friendships I’d made thus far. In late 2004, I asked my friend, Mary Ann, if she would be interested in helping me form a book club. She was very enthusiastic. Each of us asked three friends to join us. Since forming the club, two members have passed away. What was the first book you read and discussed together? Sue: The Hemingway Book Club of Kosovo by Paula Huntley. Can you tell us a little about your meetings? Sue: We meet monthly at a member’s home – each member hosts. The meeting begins with refreshments, sometimes items made specifically to reflect the book to be discussed. Leslie prepared fruit with Kirsch, a recipe from The Hemingway Cookbook by Craig Boreth for our discussion of The Paris Wife. Leslie had made the special effort of obtaining the cookbook through interlibrary loan. Kathy M: Our goodies are basic: homemade sweets, cheeses, and fruits. Often a member will try to make the goodies match the book. For example, when we discussed the book, The Help, the hostess made a southern chocolate pie – just like Minnie's without the extra ingredient. Sue: When the book club started, we selected our books month by month, each person having a turn. We decided that this system just didn’t work for us – we were reading too many books that we felt were not up to our standard for reading and discussion. A couple of years ago we started selecting our books by popular vote. I believe that we all feel that this is an excellent way to choose books. Kathy M: The book choices are compiled by late October and voted on in early November. The list of the year's selections is then given to the library in Franconia and they are kind enough to arrange, through inter-library loans, to have the 11 copies needed for the club members each month. Sue: The Abbie Greenleaf Library, where I am a trustee, is wonderful. The library staff devotes a lot of time and effort on our behalf. So do you read one book a month? Sue: We discuss from January through November. We do not discuss a book in December – this is our holiday party month. Rather than bring gifts (we did that for a while), we each bring a book which we particularly enjoyed. We give a brief description then offer to loan the book. We’ve just decided that the eleventh month will be devoted to a classic. We will have a separate vote to choose this book. We’ll have a potluck dinner at a member’s home or at a local restaurant. What are your book club conversations like? Leslie: I feel the reading guides provide focus and variety for our discussions. Sometimes there are guide questions that seem far too academic to me for our club – our members are good readers and book lovers but we're not studying for our doctorates in English Literature! Isn’t that what makes our meetings so interesting and not stressful? Sue: Keeping the conversation on topic can be a real challenge. We've tried a number of "techniques," to ensure that one person has the floor, but all of the attempts have failed in one way or another. Sue: Yes! Keeping on topic is important, but at the same time, some of our most wonderful memories are the result of being "off topic." It’s a fine line. Karen: Yes our discussions roam. Like everything else there needs to be a balance and it is never good to get totally off topic but some of the "roaming" is my favorite part as people tell their personal stories. Kathy L: We want everyone to have an equal opportunity to participate in the meeting and make an effort so everyone has input in the talk. The discussions are often lively and much fun. We all love to read. Karen: I like our way of having the "hostess" of the meeting (also the person who chose the book) choose how to run the discussion. One person cut up the list of questions and people randomly took one of the questions slips. Twice that I can think of we were assigned characters from the book and talked about the book from that character's experience. One book, Tender at the Bone, was about cooking; we had a short discussion about the book and then the hostess had us tell about our own experiences about food and its importance in our life growing up. That was one of my favorite discussions. Sue: This was one of my favorite discussions as well! Can you tell us about the sort of books you read? Anita: Books that appeal to me should be well-written, meaning that they be skillful, have powerful word choices and creative metaphors. I like to admire a book for its craftsmanship as much as its story. I also like books that educate me about periods and places in past, and recent history, and explore prejudice, hypocrisy and injustice. Sue: Some great ones have been: Snow Flower and the Secret Fan, Drowning Ruth, Loving Frank, and To Kill A Mockingbird. My favorite was Angle of Repose. We used the discussion questions, and they were exceptional. Each question lead to the next, making the entire discussion flow from one topic to the other. This discussion was a half hour longer than most, and we had to cut it short – we could have kept talking! A particularly memorable book was Nefertiti. Anita, our host, prepared dishes evocative of the era and region; Kathy and Barbara each wore a dress purchased in Egypt; and we had a conversation with the book’s author, Michelle Moran. Rita: We seem to favor books with historical backgrounds and those with an autobiographical bent. We have avoided books with religious leanings as well as romance. Some books that generated good discussion were The Red Tent, Three Cups of Tea, China Road, The Good Earth, and Sarah’s Key. Do you ever do anything together outside of your book club meetings? Rita: Reading Loving Frank resulted in a trip to one of F. L. Wright’s homes. Sue: Yes, Zimmerman House, which is a property of the Currier Museum in Manchester, NH. Mary Ann: After reading Snow Flower and the Secret Fan, we had a trip to Boston to see an actual Chinese home shipped piece by piece to the Peabody-Essex Museum. Barbara: The house was much like those described in the book. This also led me personally to read many other books dealing with Chinese women. Field trips! What a good idea! Have you done others? Barbara: We've done dinner and a movie. Sue: For two books: The Water is Wide by Pat Conroy and The Namesake by Jhumpra Lahiri. Have you been surprised by any of the books you have read? Karen: I think we would agree that some of the books we liked the least generate the best discussions. Tender at the Bone is a good example. And The Devil in the White City was not my particular favorite but the discussion was fabulous. What I like about book club is that it gets me to read books I never would have chosen myself such as The Paris Wife or Loving Frank. Hemmingway and Wright are not my favorite characters but these two books gave fresh insights into them and their work and I loved them. We have an especially hilarious (and risqué) discussion about Loving Frank – our oldest member, Ruth, being the most memorable contributor to the fun. And I have to ask – have you ever read a book that just didn't work for any of you? Leslie: Generally the books have been well received, some more popular than others. We have had just one disaster – The Almost Moon, not liked by any member. Karen: We all had this surprisingly hostile reaction to the book and often kid about it. Sue: She never had a chance to explain, so we’ll always wonder, and we lightheartedly joke about her choice and think of her fondly when we laugh about this. When she passed, her husband made sure that the FRESH Ladies received the set of tea cups that she used when she hosted the meeting. Each of us has a memento of Carole. Wow. That gesture speaks volumes about how close you all are… One more question. What advice do you have for other book groups? Sue: During our first meeting as a group, we set some ground rules for books and discussion. We don’t discuss politics and religion. We’ve kept to this – very important. Don’t invite someone to join unless you feel confident that they’ll fit in with the group and add to the discussion in a positive way. Rita: Limit membership. Small groups make for greater discussion. Kathy M: Try to get a variety of ages and interests among the members. I do miss our member who was in her 30s and her very different perspectives and ideas. Great advice, ladies! Anything else you'd like to add? Kathy L: All the members have brought their own rich life’s experiences, both wonderful and tragic, to enhance the lively discussions we have. I love this group. They have all enriched my life. Anita: I like the club because it forces me to read, and is a ready-made book selection vehicle for me who never reads book reviews. I very much enjoy the 1-2 hour focused discussion. True, we slide off track, but we get ourselves back on. I appreciate that everyone tries, and we respect each other for that. It is a reFRESHing interlude that I look forward to each month. I am never disappointed. Thank you all so very much! Happy reading! 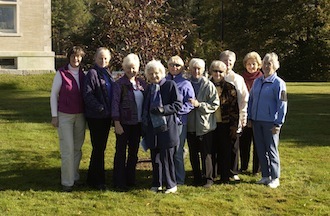 The group photo is taken in front of the Purple Prince Crab Apple tree that the FRESH Ladies planted at Abbie Greenleaf Library in Franconia in memory of member Helen Pimental, who passed away in December, 2009.